Today Paramount has issued their press release (below) with details about the 3D Transformers: Dark of the Moon Combo set and the Signature edition of the trilogy set. The release verifies the special features of the 3D set aka the "Ultimate Edition" referred to back in September. This four disc set will be the Blu-ray movie (disc 1), bonus features (disc 2), 3D movie (disc 3), and DVD/Digital copy (disc 4). The current cost on Amazon is $38.49. As for the Michael Bay signed edition, now called the "Limited Collector's Edition Blu-ray Trilogy", the image above is what it will look like. It comes with seven Blu-ray discs which is essentially a combination of the Blu-ray editions of each movie and their special features minus any DVDs. Ultraviolet is handling the digital copy so no extra discs for that. 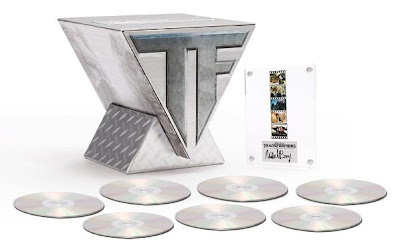 The set is the 2-disc special edition of Transformers, 2-disc Special Edition of Transformers: Revenge of the Fallen, and 3-disc Ultimate Edition of Transformers: Dark of the Moon in regular and 3D versions. Unless things have changed, this set is limited to around 5000 copies and currently being sold only through Amazon. The pre-order page is now up with a cost of $104.99. Both the Ultimate and Limited editions will be released on January 31st, 2012 in the United States. I don't believe the Limited Edition will be released outside the US. If ordering, make sure to use my links so this site gets credit for purchases. HOLLYWOOD, CALIF. (December 27, 2011) – From director Michael Bay and executive producer Steven Spielberg, in association with Hasbro, Paramount Pictures’ global smash hit Transformers: Dark of the Moon returns to Earth January 31, 2012 in a four-disc Ultimate Edition Blu-ray 3D, Blu-ray and DVD combo pack with UltraViolet™ and a Digital Copy. A must-own film for every home media collection, Transformers: Dark of the Moon features “jaw-droppingly amazing 3D” (Harry Knowles, AintItCool.com) and fan-favorite characters OPTIMUS PRIME, BUMBLEBEE and Sam Witwicky amidst bigger and more spectacular action in an adventure that surpassed its predecessors to earn over $1.1 billion at the worldwide box office and become the #4 biggest movie of all time at the global box office. Bursting with nearly four hours of sensational behind-the-scenes footage, cast and crew interviews and more, the Transformers: Dark of the Moon Blu-ray 3D, Blu-ray and DVD combo pack delivers blockbuster entertainment. And, for a limited time, all three eye-popping films in the Transformers franchise will be available in a 7-Disc Limited Collector’s Edition Blu-ray Trilogy featuring each film in high definition, Transformers: Dark of the Moon in high definition 3D, more than 10 hours of special features and a plaque of movie images signed by Bay. The ongoing epic story of the mighty AUTOBOTS continues in Transformers: Dark of the Moon and the four-disc Blu-ray 3D, Blu-ray and DVD combo pack takes fans behind-the-scenes, across the U.S. and into the far reaches of space for a fully immersive entertainment experience. The set includes a nearly two-hour documentary about the making of the film, which follows the cast and crew around the world, reveals the secrets behind the breathtaking stunts, including more footage of the amazing “birdmen,” and documents the film’s progress all the way through its triumphant release. Plus, additional features show how Chicago was transformed into the movie’s biggest action set, offer a look inside NASA, unveil artists’ renderings of the AUTOBOTS and DECEPTICONS and much, much more. The combo pack will also be enabled with UltraViolet, a new way to collect, access and enjoy movies. With UltraViolet, consumers can add movies to their digital collection in the cloud, and then stream or download them – safely and securely – to a variety of devices. 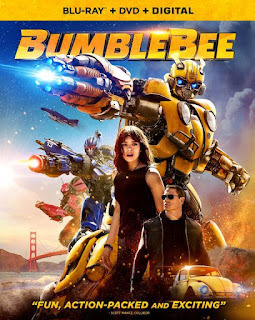 The Transformers: Dark of the Moon Blu-ray 3D and Blu-ray are presented in 1080p high definition with English 7.1 Dolby TrueHD, English 5.1 Discrete Dolby Digital, English 2.0 Discrete Surround Dolby Digital, French 5.1 Dolby Digital, Spanish 5.1 Dolby Digital, Portuguese 5.1 Dolby Digital and English Audio Description and English, English SDH, French, Spanish and Portuguese subtitles. The English 5.1 and English 2.0 tracks were each individually mastered to ensure optimal sound for the home entertainment experience. The DVD is presented in widescreen enhanced for 16:9 televisions with Dolby Digital English 5.1 Surround, English 2.0 Discrete Surround, French 5.1 Surround, Spanish 5.1 Surround and English Audio Description and English, French, Spanish and Portuguese subtitles. • Two-disc Special Edition Blu-ray of Transformers presented in 1080p high definition with English 5.1 Dolby TrueHD, French 5.1 Dolby Digital and Spanish 5.1 Dolby Digital and English, English SDH, French, Spanish and Portuguese subtitles. • Two-disc Special Edition Blu-ray of Transformers: Revenge of the Fallen presented in 1080p high definition with English 5.1 DTS-HD Master Audio, French 5.1 Dolby Digital and Spanish 5.1 Dolby Digital and English, English SDH, French, Spanish and Portuguese subtitles. A mysterious event from Earth’s past threatens to ignite a war so big that the TRANSFORMERS alone will not be able to save the planet. 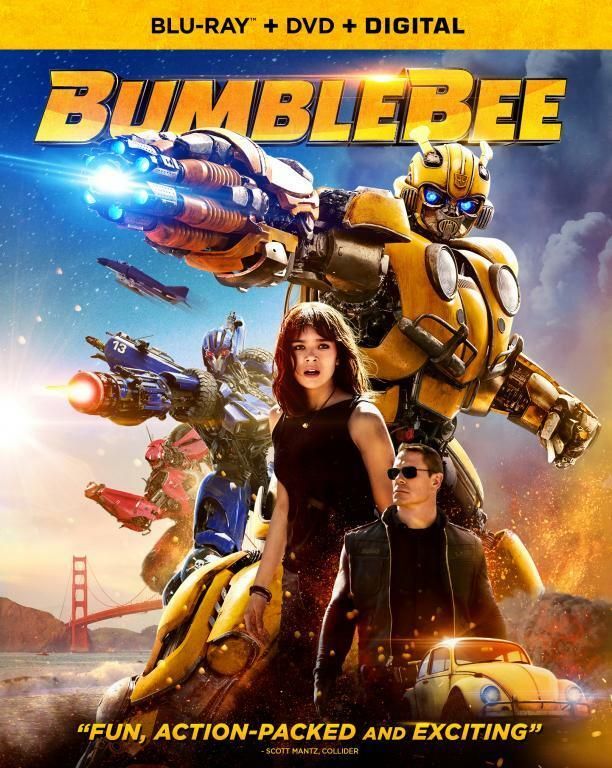 Sam Witwicky (Shia LaBeouf) and the AUTOBOTS must fight against the darkness to defend our world from the DECEPTICONS’ all-consuming evil in the smash hit from director Michael Bay and executive producer Steven Spielberg. but... isnt there a godmode cheat or unlimited ammo? Just pre-ordered it through your site. I have been a frequent visitor and its my little way of saying thanks for spending the time doing this. is there any extra or cut footage in the DOTM sets? What? No Michael Bay commentary for Dark of the Moon??? Wondering the same in regards to anon's post. Kinda scratching my head on missing commentary. Honestly that's the part I enjoy most with the series. I can understand time and budget issues. But it does seem bizarre not to include it. Hmm, wait some Blu-Ray movies have it hidden somewhere. Speaking of collections, is there any plans to release a 2 disc SE of DOTM for regular DVD owners? I hope it's not limited or US only. Need to get my hands on that Bluray.